Well you know the rest. I actually got in and out of the hairdresser in under two hours. Minor miracle yes I know especially on a Saturday but things are good. We had another good conversation about what I'm doing well, both remarking about how well my hair (and her hair since her big chop) is growing out. Knowing that I need to do better in some areas and giving me some tips on what else I can do to keep my hair healthy and growing. Love my stylist really. We also talked about Cupcake Provocateur, may have snagged her another customer lol. So I relaxed at 13 weeks post and knew I was in need of a trim. For a while I was thinking it was a slow growth three months and with a trim of around an inch I was prepared for no net length. However, the longer I was away from the shop and subject to the wind I could tell it was longer than I thought but still not quite where I would mark it to claim full shoulder length. I'll find my last relaxer pictures and make a comparison shot in a second. I never know why I type that. You don't care if it's in a second or five years, just want to see the photos. And I was right, there's some net growth just not a lot of it retained in the way I would enjoy. I'll keep tending to my ends and try to do better. But hair in the back was above my necklace after the last relaxer and is just under it or touching it after today's relaxer. 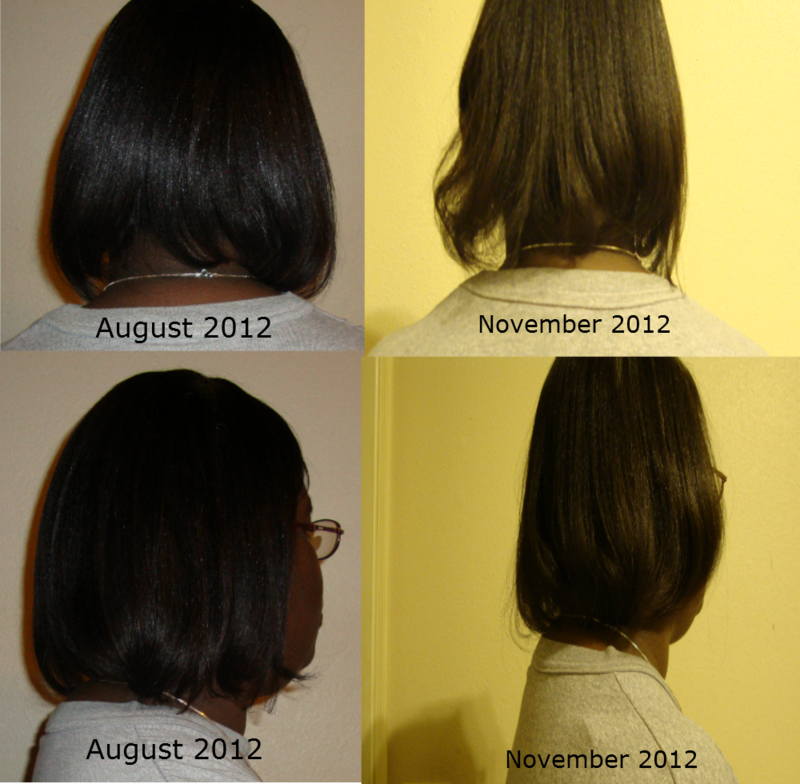 The side shots show more fullness to me not necessarily a lot of growth on the side I shot but more on the left side. Either way growth and thickness is good. I also boxed up all the gifts for my line sisters and after another address check I'll get these out into the US mail. Without the fresh dye job the hair is looking a little dull in these shots but it could also be the lighting. I know I took them in the same location so I must not have had on the same amount of lights or did something goofy with my camera which is so not out of the realm of possibility. Oh well, I think that's it for today. I love being able to touch my scalp without getting into that mini afro that was hanging out there lol. Yeah I really do like her. I've been seeing her for probably six/seven years now so she knows my hair, knows what I'm trying to do with the whole hair journey thing and is really a good friend. We can joke and be silly and then talk about what we need to do with my hair. And I got her by accident. She worked at a shop with one of the only other stylists that was recommended to me and the other one was booked up I think so I got mine. She totally rocks.